The 2018 Mini Cooper S E All4 Countryman is fitted with a 1.5-liter turbocharged engine and an electric motor that produce a combined 221 hp and 284 lb-ft, a 6-speed automatic transmission sends the power to all four wheels. It is fuel efficient and performance and handling levels are excellent for the class, this Mini also offers a comfortable ride and plenty of interior space. The basic specification levels include heated sport front seats, LED headlights and a rearview camera and available options include an 8.8-inch touchscreen with navigation an active driving assistant. A long list of available customizations makes this hybrid Countryman a desirable and stylish alternative to the competition. The Cooper range has always offered a characterful alternative to shoppers in the subcompact segment and while the Countryman may be a fair bit larger, it retains that sporty, fun-loving nature of its stablemates. 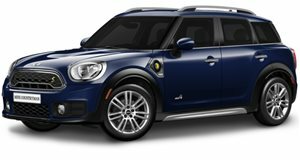 For 2018 the addition of the Cooper S E Countryman ALL4 adds hybrid efficiency to the line-up. The expanded exterior may have lost a little bit of the charm of the smaller Cooper hardtop models but the Countryman still looks quite distinctive and the interior is now more accommodating for larger adults too. Material quality is as good as it gets in this class of car, the stylish design and unique switchgear add to the premium feel. The front seats offer plenty of adjustment however the intrusive side bolsters can make longer trips uncomfortable and opting for the non-sport seats may be a good idea. This Mini also offers decent rear seating with enough leg and headroom for most. The higher ride height also makes it easy to step in and out of the car, something owners of smaller Minis will not be accustomed to. Cargo space too is better than in any other Mini derivative although it is slightly smaller than the class average. Ride comfort is a big step up from the smaller Minis in the range and the refinement levels are much improved too, wind noise is kept to a minimum on the highway and the transition between electric and gasoline power is all but imperceptible. Ultimate grip and handling levels are good for the class and the Countryman S E still exhibits that chuckable character that makes a Mini such an enjoyable companion along a twisty stretch of road. The electric motor provides strong torque delivery low down to complement the gasoline engine and you have the choice of recharging the battery pack or allowing the engine to recharge it as you drive. The Cooper S E is fitted with the 1.5-liter turbocharged 3-cylinder engine found in the base Cooper and it drives the front wheels. It also features an electric motor that powers the rear wheels only. A 6-speed automatic transmission is standard. The combined output of 221 horsepower and 284 lb-ft of torque places it between the 189 hp Cooper S and 228 hp JCW models and the performance levels follow a similar pattern, with the 0-60 mph time of 6.7-seconds slotting in-between the two gasoline powered models. It also offers strong overtaking acceleration thanks to that immediate torque delivery. Fuel consumption should be significantly better than both though and you can also drive on electric power alone for up to 12-miles. The EPA estimates a 65 MPGe fuel efficiency figure and a range of 270 miles. The Cooper S E comes equipped with broadly the same basic specification levels as the all-wheel drive Cooper S, this means 18-inch alloy wheels, LED headlights, auto-wipers, heated exterior mirrors, ambient lighting, heated front sport seats, leatherette upholstery, keyless entry and heated windshield wipers. A 6.5-inch display offers Bluetooth and smartphone integration and a rearview camera with rear parking sensors is integrated into the system. An available parking assistant, active driving assistant, Harman/Kardon audio system and head-up display can also be specified. Other available options include an 8-8-inch touchscreen with navigation, leather upholstery and a power tailgate. These and other extras can be grouped in the Convenience, Premium and Technology Packages or chosen as standalone items. The long list of customizable interior and exterior details allow customers to further personalize their car and various upholstery colors, interior surfaces and funky colors are on offer. 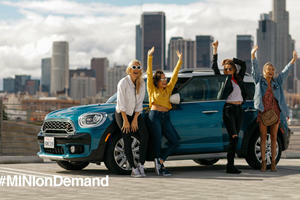 The 2018 Mini Cooper S E All4 Countryman offers a unique package of style, efficiency and practicality that sees it stack up well against the competition. A comfortable ride, strong performance and class-leading build quality also add to its appeal but its asking price puts it up against some capable alternatives and once you have added a few extras this hybrid Mini could be a tough sell. 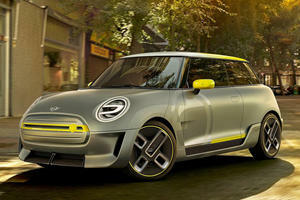 If Smart cars are, why not Mini? Yes, this is really a thing.